Samosa: peas, potatoes, carrots, corn, enriched flour, water, onion, salt, ginger, green chilis, lemon juice, cilantro, canola oil, herbs, spices, citric acid. Chutney: tamarind, water, brown sugar, salt, ginger, red chilis, cilantro, canola oil, vinegar, herbs and spices. All natural delight. Mouth watering pastries filled with delicately spiced vegetables and tamarind chutney. This product traveled 5 km to reach our warehouse. 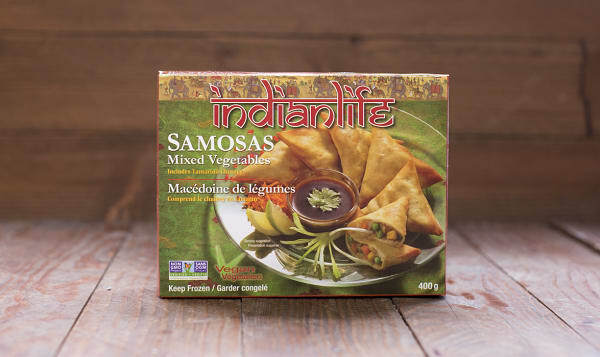 Indian Life is a Canadian company producing gourmet vegetarian food from the Indian subcontinent. Since 1993 Indian Life has been offering a line of exotic high quality of gourmet Indian food that have been cherished by consumers around the world. Their commitment to quality demands only the finest ingredients in their products. Indian Life's products are made to an authentic Indian recipe under sanitary and hygienic conditions. They use the finest quality ingredients in manufacturing of its products. Every raw material is carefully searched for quality of supply. Indian Life's spices are ground to its own specifications and are from approved HACCP approved plants.